Here at ChiIL Mama and ChiIL Live Shows, we're thrilled this production is back in sweet home Chicago. I caught it back in 2013, and can't wait for my 15 year old son to see it with me this time. 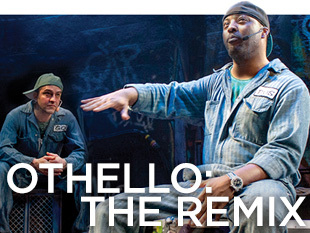 Othello: The Remix is a modern, hip hop version of Othello that does Shakespeare proud. It's revitalized this production and made it accessible and fun for the masses. It was pure magic to see the multigenerational appeal of this show, that extends well beyond fans of the genre. It's so rewarding to see youth actually enjoying and understanding Shakespeare. The Q Brothers' knack for timing, rhythm and wordplay is their true genius. Highly recommended. We'll be there for the press opening tonight and we'll have a full review of the 2016 OTHELLO: THE REMIX redux up shortly. Chicago Shakespeare Theater (CST) presents a highlight of Shakespeare 400 Chicago—The Q Brothers’ 90-minute hip-hop adaptation of William Shakespeare’s tragedy, Othello: The Remix, spun out and lyrically rewritten over original beats. Developed by hip-hop sensations GQ and JQ with CST Creative Producer Rick Boynton, this production has toured widely since its world premiere at Shakespeare’s Globe as part of the 2012 London Cultural Olympiad. It returns after playing to sold-out houses of multi-generational audiences in Edinburgh, London, Australia, Germany, South Korea and Poland. Othello: The Remix is presented in the theater Upstairs at Chicago Shakespeare, April 12–May 8, 2016. Othello: The Remix returns in April, the month of Shakespeare’s birthday and the anniversary of his death, an exciting contribution to Shakespeare 400 Chicago. The yearlong festival is spearheaded by Chicago Shakespeare Theater, inviting the city’s world-class institutions and leading artists from around the globe to interpret and reimagine Shakespeare’s work in 850 events on stages and in museums, parks, schools, neighborhoods and even restaurants across the city throughout 2016. The Q Brothers’ Othello: The Remix has captivated audiences globally and garnered acclaim and multiple honors—including Edinburgh’s Musical Theatre Matters Award for Best New Musical Theatre Show and the Joseph Jefferson Award for Best Ensemble. Most recently, The Q Brothers’ production traveled to Australia’s Arts Centre Melbourne, to Dubai and Abu Dhabi in the United Arab Emirates with Art for All, and to New Zealand for the Auckland Arts Festival. It now returns to Chicago Shakespeare, where the production previously enjoyed a twice-extended twenty-week run in 2013. Othello: The Remix is written, directed and composed by The Q Brothers, GQ and JQ, siblings born and raised in Chicago. The production is one of three collaborative “ad-rap-tations” with Creative Producer Rick Boynton. The Daily Telegraph (UK) gave it five stars and called it “a triumph from beginning to end.” It comes highly recommended by the Chicago Sun-Times and was praised as “well-paced, sophisticated and very funny” by The Guardian. The cast of this critically acclaimed production includes Postell Pringle as Othello, with GQ, JQ and Jackson Doran filling multiple roles and DJ Clayton Stamper spinning from the turntable. The award-winning design team includes Scenic and Costume Designer Scott Davis, Lighting Designer Greg Hofmann—with original lighting designs by Jesse Klug—and CST’s resident Wig and Make-up Designer Melissa Veal. Directed by GQ and JQ, Othello: The Remix is presented in association with Richard Jordan Productions. Othello: The Remix is presented in the theater Upstairs at Chicago Shakespeare, April 12–May 8, 2016. Tickets start at just $35 and as little as $20 for anyone under age 35 through Chicago Shakespeare Theater’s Box Office at 312.595.5600 or online at www.chicagoshakes.com. Shakespeare 400 Chicago explores Shakespeare’s enduring legacy across languages and disciplines including theater, dance, literature, music, cuisine and spectacle. The yearlong international arts festival brings together the city’s resident world-class institutions, and welcomes leading artists from around the globe to celebrate, interpret and reimagine Shakespeare’s work. Upcoming highlights include: the Art Institute of Chicago’s Supernatural Shakespeare exhibit (April 11–October 10); Chicago Symphony Orchestra’s performances of Berlioz’s Romeo and Juliet (April 7–9) and Falstaff (April 21–26); Northwestern University Alice Kaplan Institute for the Humanities and Mary and Leigh Block Museum of Art’s screening of the 1974 Othello adaptation Catch My Soul (April 22); Northwestern University Alice Kaplan Institute for the Humanities’ presentation of the interactive Shakespeare video game Play the Knave, created by University of California Davis Professor Gina Bloom and the ModLab (April 28); Chicago Symphony Orchestra and the Art Institute of Chicago’s concert CSO at the AIC: A World of Characters (May 1); and Chicago Shakespeare Theater’s debut of Tug of War: Foreign Fire, the first of a two-part, six-play Shakespeare history cycle directed by Artistic Director Barbara Gaines (May 12–June 12).